On April 8, 2017, in Athens, my first encounter of documenta 14 was marked by the translation of Arseny Avraamov’s Symphony of Sirens (1919–1923). Installed within the upper level galleries of the EMST, National Museum of Contemporary Art Athens, archival text and scores related to the composer’s original work, Symphony of Factory Horns, envelop the space. The symphony, which intended to transform the framework of the industrial city into a musical instrument in itself, was recorded by Avraamov from telegraph poles; a vast orchestra composed from cannons sounding, marine military vessels, artillery, locomotives, and hydroplanes, among other sources. Avraamov’s work unfolds against the backdrop of Soviet political context. Conceived as a sonic interpretation of modernism, the creation of the piece was aligned as a celebration of the 1917 October Revolution, which celebrates its centennial anniversary as this issue of the publication is being produced. Politics are rarely separated from experience, but are especially close in the context of sight and sound. In our current climate, image and rhetoric have never been so discerning. The premise and approach of Graphical Sound is not unlike the work of many artists and writers included within this edition of the publication: taking the disposition of one form, and translating its content by means of another unrelated vehicle to arrive at a new production. We begin the cover of Issue 05 of THE SEEN, featuring Moroccan-French artist Bouchra Khalili’s work from The Constellations Series, on the occasion of her inclusion in the Palais de Tokyo’s exhibition, entitled Singing Stones, which traces the literal resonance between art and architecture. Featured as an experimental interview, which splices texts by both the artist and Staff Writer Natalie Hegert, Khalili’s work serves as a kind of ‘north star’—a touchpoint for which the other pieces can be navigated. The work belongs to a series of many prints that translate the illegal journeys of individuals across borders as white points against deep blue hues. Their pathways are rendered as if they were coordinates in the sky, or the sea—similarly borderless fields. We begin the cover of Issue 05 of THE SEEN, featuring Moroccan-French artist Bouchra Khalili’s work from The Constellations Series, on the occasion of her inclusion in the Palais de Tokyo’s exhibition, entitled Singing Stones, which traces the literal resonance between art and architecture. Featured as an experimental interview, which splices texts by both the artist and Staff Writer Natalie Hegert, Khalili’s work serves as a kind of ‘north star’—a touchpoint for which the other pieces can be navigated. The work belongs to a series of many prints that translate the illegal journeys of individuals across borders as white points against deep blue hues. Their pathways are rendered as if they were coordinates in the sky, or the sea—similarly borderless fields. Khalili’s work poetically addresses the current migrant crisis and issues of travel, which are similarly discussed in the context of other pieces, including Caroline Picard’s poignant and intricate text on documenta 14 in Kassel and Athens, or Amalia Pica’s interview, which traces how the bureaucracy inherent within the immigrant experience translates to her contrastingly celebratory visual language. As with the inclusion of Avraamov’s work in documenta 14, Space Force Construction—installed in Venice at the V–A–C Foundation before its iteration at the Art Institute of Chicago this Fall— is similarly timely to the 2017 centennial of the October Revolution, and is featured as an interview with the curators by Anastasia Karpova- Tinari. This political undercurrent is also explored through architecture—in exhibitions aligning with the Chicago Architecture Biennial—such as in Terence Gower’s Havana Case Studies at the Neubauer Collegium for Culture and Society at the University of Chicago, whose interview covers the roots of his research and projects on US Embassies in enemy territory. Issue 05 of THE SEEN is marked substantial collaborations with each of my Staff Writers—including a translation of Guillaume Désanges’ brilliant speculative essay on the unlikely, but critical coincidence that compares Marcel Duchamp and Rocky Balboa, sparked from a conversation we had in Paris in 2015. We are also thrilled to be publishing Gaylen Gerber’s text with Eva Badura-Triska, in advance of its publication as part of the Artist Lecture Series Vienna, allowing our readers a glimpse into this expansive and insightful consideration of his practice and most current body of work. A special thank you to Gaylen for his dedication in working with us so closely on this piece. As always, I remain grateful to Publisher Tony Karman, whose continued support of THE SEEN has allowed us to publish our largest issue to date. We are indebted to Ashley Ryann, and Jason Pickleman, of JNL Graphic Design—without your keen design and collaboration, this publication would not be possible. Additional thank you to my Editorial Assistant, Gabrielle Welsh, for her work in assisting with this edition, and to Newcity Custom Publishing for helping to manage production and distribution. We close with our special edition insert, which I had the pleasure of selecting and introducing, featuring Barbara Bloom’s Musical Scores. This inclusion would not have been possible without the collaboration of David Lewis Gallery—thank you to Dmitry Komis for working with me so closely on this piece. The artwork—five spreads for Issue 05—is placed among the center pages of THE SEEN, as if it were a musical composition book itself. In addition to the select texts and works included within this edition of publication, I could not be more proud of all THE SEEN Staff Writers, and their commitment to producing engaging and relevant art criticism that bridges how we experience contemporary art. Sight and sound have never been so close. 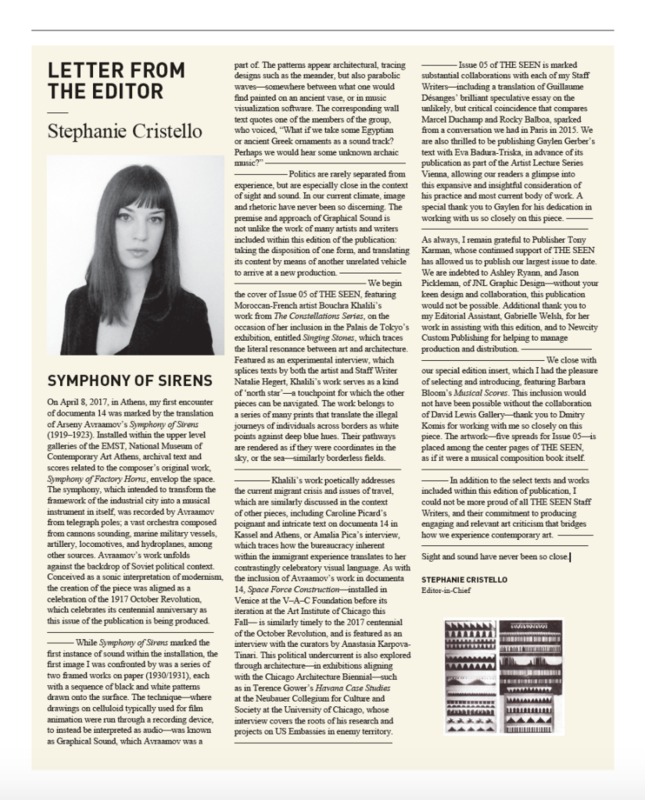 September 12, 2017 | Filed under Art Seen: International and tagged with Issue 05, Stephanie Cristello, The Seen, THE SEEN Issue 05.